How do I use Endicia Galaxy with 3dcart? Endicia allows you to print postage labels for your 3dcart orders. Your 3dcart store, can export your order information in a format that will be read by Endicia for the generating of said labels. However, before you get started, there are a couple of things that need to be done on your Endicia Galaxy configuration in order for data to be transferred from the 3dcart Store. This guide will take you through the steps necessary for the integration. You must have an Endicia account and Galaxy installed on your computer for this to work. If you do not currently have Galaxy, please contact Endicia, then start this guide. Use the Search bar at the top of the page to search for "Endicia"
Once there, select a date or invoice number range for the orders that you'd like to export as well as the status the orders are in. Click "Export" at the top right to generate your file. Next you will need to configure your computer to use this downloaded file and your Endicia program correctly. Click Select, and find the galaxy file you downloaded in step 1. You may now close the ODBC Data Source Administrator window. Click on the "Database Setup"
Under ODBC data source, click SELECT, a list of sources will appear. If your shipping method names are not the same as USPS names them, (ie. Express Mail is labeled “Express” on your shopping cart settings), then please complete the following step. Click on Mail Class and select the USPS method from the drop down. 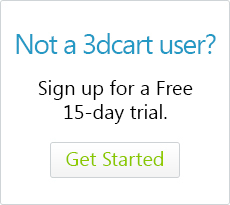 Then, in the text box, enter the name for the shipping method as you have it defined on your 3dcart store's settings. Next, click on the RECIPIENT ADDRESS Tab. The recipient address fields need to be mapped. The process is the same as you just did for referenceID and Service. Once you’ve mapped all the fields, you may click OK on the bottom of the window. Next, we'll configure the Post-Back options which will allow you to add tracking numbers to your 3dcart store. Under ODBC data source, click SELECT and a list of sources will appear. Configuration is now completed and you're ready to perform your first Import. Once the export is completed, you will be prompted to save the file to your computer. On the ReferenceID enter order # and press Enter. The information for the order is pulled up. Make any changes, and print the label when ready. Once you’ve printed all of your labels, you will want to import the tracking information back to your 3dcart store. Look towards the bottom and click on the Browse button under "Import Tracking Numbers"